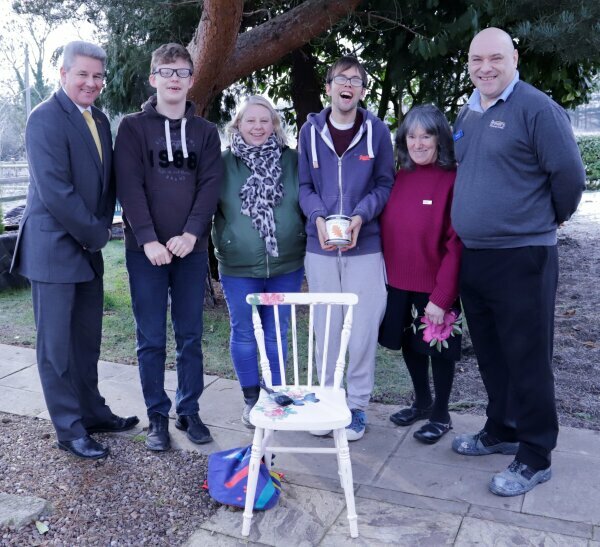 A furniture upcycling enterprise providing work placements for students at a specialist college has received a helping hand with a generous donation of paints, equipment and a top-of-the range A3 printer. Students at Derwen College’s Wrexham satellite ‘Ashdale House’ – a specialist college for young people with learning disabilities and difficulties – have received sponsorship from Brewers Decorator Centres for their new business, Hŵre, supplying the college site with all the paints, wallpaper, brushes, varnishes and sandpaper they need plus an A3 printer! She said: "This means so much to us and to our upcycling business Hŵre. The students were thrilled to receive all the paint and materials needed to transform unwanted furniture into unique statement pieces. Regional Manager Laurence Zing and Wrexham Branch Manager Shaun McKenzie said that once they heard about Derwen College, they were more than happy to help. “Providing paint and equipment for Ashdale is a very small financial burden to us in the grand scheme of things but clearly means such a lot to staff and students. The money that they save on materials and equipment can then be better spent supporting students in other ways. Derwen at Ashdale opened as a satellite from the main Derwen College site in Gobowen four years ago providing vocational and independence training for young people with a wide range of learning difficulties and disabilities. Click for more information on Derwen College events, satellites, curriculum and work experience. Image left to right: Brewers Regional Manager Laurence Zing, Louis Thomas, Ashdale Satellite Co-ordinator Sian Roberts, Louis Eckersley-Carr, president of Wrexham Rotary Pene Coles, and Wrexham Branch Manager Shaun McKenzie.